Stomatopods are crustaceans, distantly related to crabs, shrimp, and lobster. Relatively little is known about them even though they are one of the major invertebrate predators on coral reefs, sea grass beds and sand and rubble flats. Roy Caldwell, a biologist at UC Berkeley, has been studying stomatopods for over 30 years. 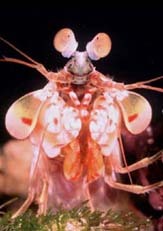 In July 2001, a research team spent 10 days living underwater in the Aquarius habitat to learn more about stomatopods in their natural environment. Join Roy and his team on the Aquarius mission, as they explore several research questions about stomatopods: polarized signalling, monogamy, and the behavior of larval stomatopods. Or you can begin your visit with a look at what we already know about stomatopods: their evolution, behavior, and vision. Dive in (using the sidebar) to learn more! Learn more about stomatopods in UCMP's Introduction to Stomatopods.